Barcelona boss Ernesto Valverde has expressed confidence in his star talisman Lionel Messi's form ahead of their Clasico against Real Madrid, stating that the Argentine is in "very good shape". Real Madrid are set to play host to Barcelona in the second Clasico of the week and will hope to avenge their Copa del Rey defeat and subsequent elimination on Wednesday night. Barcelona established a 3-0 victory in the Cup on Wednesday, securing a 4-1 aggregate, to earn a place in the Copa del Rey final. Blaugrana captain Messi may have not scored in both legs of the semi-final but he continues to play a pivotal role in the Cup as well as the race for the league title. 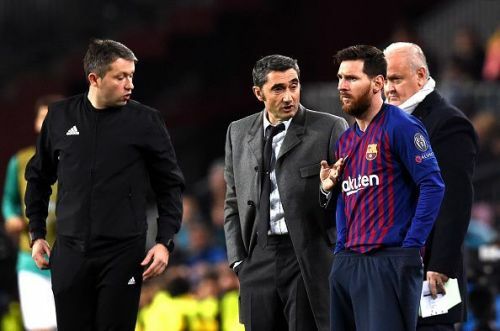 Messi was initially not thought to be fully fit after sustaining a thigh injury against Valencia last month but it appears Valverde has no worries regarding the Argentine. Valverde has now revealed that he is happy with his captain, stating that the Argentine always performs when he needs to. Speaking in a pre-match conference, the Blaugrana boss said (via Reuters), "I think he is in good shape, very good shape. You always expect a lot of your players, Messi included. He always performs, even though in some games he performs less than in others. We have to play well in order for him to perform." Valverde looked back at the Copa del Rey semi-final and admitted that Barcelona were not at their best with Real Madrid looking sometimes dangerous in their area. "It’s true that the other day there were spells when we did not play well, they kept arriving in our area and looked dangerous, and we only created two or three chances. The aim is always to improve and create more chances." "We are playing for points, it’s a different competition to Wednesday and it’s difficult to get the same result in two games in a row but we will try and win." "It would give us a huge confidence boost and take more points from Madrid, who are a direct rival. On Wednesday we all saw how difficult it is to play there, but we’ll give it a go." Following a series of Clasico defeats, Real Madrid will hope to turn the tables around this season when they face Barcelona later at 1:15 am (IST). Messi vs Ronaldo: Who was better during their decade-long El Clasico rivalry?